Next year, around 14 lakh students of class 10th and 12 lakh students of class 12th will appear of CBSE Board exams. Thanks to the Digital India initiatives of PM Modi Government, these students can now get their books for free, online. In one of the biggest decisions, Union Minister of Human Resource Department, Smriti Irani has announced that henceforth, all books under CBSE curriculum would be freely available for students. Around 45 days back, all NCERT books were made free for online access, and the same has now been repeated for CBSE curriculum as well. Considering that students need to spend considerable amount of money on purchasing text books, this move can have far reaching consequences for the society. Now, even a student from economically backward section can use the power of Internet, and download the necessary books without spending a dime to the publishers. As if, Internet has suddenly balanced the divide between rich and poor ; and made education equal privilege for all. 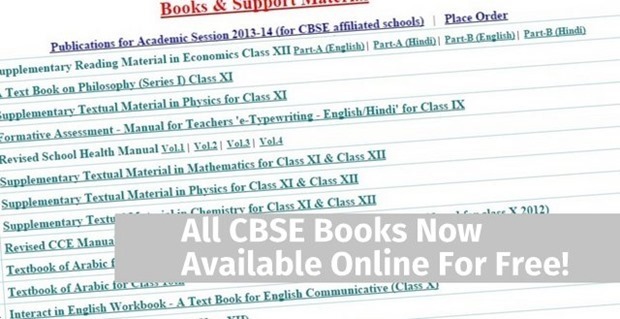 Some essential CBSE books were already available for free since last few years. The present Government has taken this initiative one step forward, and made it even more accessible. Smriti Irani also called for overall development of students, which will ensure that our society is populated with responsible and matured adults. She announced that Centre will launch two special programs for Kendriya Vidyalayas in the next academic year, especially created for Class 1 to Class 12 students: ‘Shaala Darpan’ and ‘Saransh’. Under ‘Shaala Darpan’, parents will be informed via SMS about their child’s attendance status, marks and time table of the day. While ‘Saransh’ (English: Summary) will assist the parents in comparing their child’s marks with other students at the regional, city, state and national level. In the month of November, Smriti Irani had announced free availability of all NCERT books under ‘e-Pathshala’ program. Besides desktop, these books would be now available on mobile based apps as well. In June this year, Govt. had announced a unique ‘e-Basta’ program for free access to all digital books meant for different boards. It was not just an e-library but a comprehensive platform for school book publishers, teachers, students and parents. Khan Academy has also launched their India-centric Youtube channel, which will further assist students to access high quality educational content for free. Tata Trust has invested in this idea of revolutionizing education using technology and Internet. "All CBSE Books Will Now Be Available Online For Free #DigitalIndia", 5 out of 5 based on 3 ratings. Great Step. We must appreciate The Digital India Initiative of Prime Minister Narendra Modi. Narendra Modi will surely convert India into a knowledge economy which is digitally empowered, in long run, and that digitalization does not reach the doorsteps of only one section of the society, but it will ensure that the whole country progresses together. Thanks Mohul for sharing this. Good! Education is not a realm of profiteering! Kick out these publishers, they only rip off the system! Kahn Academy is doing the right thing, free education for all!